It begins with a disappearance… In the waning days of World War II, the Obake Neko is the last surviving Sen-Toku—a huge secret aircraft-carrier submarine created by the Imperial Japanese Navy. As the war comes to an end, the Obake Neko sets sail back to Japan with a cargo of unimaginable value. In the chaos of Japanese surrender, the clandestine vessel and its crew vanish in the seas of the South Pacific. Fifty-five years after the war’s end, former U.S. Navy pilot, Bud Brennan breaks into Pearl Harbor’s submarine museum in Hawaii. Bud’s son, Mike, is still raw from the death of his wife and grappling with a new career but still jumps in to help his dad. 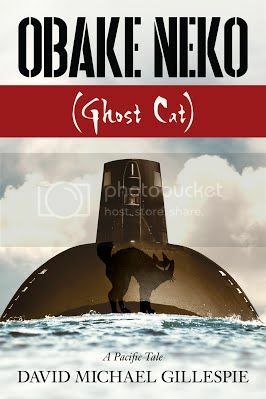 But when Bud’s antics garner the attention of the Navy’s JAG, Mike realizes his father may possess knowledge about the near-mythical Obake Neko and its fabled cargo—knowledge that is also of great value to the Japanese Yakuza. Now, Mike must scramble to learn the whole truth of his father’s decades-old connection with the legendary Japanese submarine and fight to defend his father from relentless military authorities and deadly Yakuza operatives. Even decades later, the Obake Neko and its legendary cargo are still worth killing over. Can Mike discover the truth and protect his dad before deadly assailants succeed in silencing Bud forever? David Gillespie moved to Hawaii as a teenager, where he attended public schools and graduated with a BBA and MBA from the University of Hawaii at Manoa. Gillespie has had a varied career in Hawaii’s business community. As a consultant with a University of Hawaii program, he traveled to many Pacific Island nations. His experiences in these exotic locales, along with his keen interest and research about the Sen-Toku Japanese submarines, inform and enhance his writing. Gillespie is retired and has taken up home improvement projects, earned a private pilot license, and works on writing historical adventure novels. He continues to enjoy life in Hawaii, his home, with his family and a tuxedo cat named Tick Tock. More September Dates Coming Soon!